All India Bar Exam (AIBE) 2018 aims to judge the ability of a lawyer to practice the profession of law in India. AIBE is conducted by the Bar Council of India on yearly basis. All those who candidates have cleared their Law degree are eligible to apply. All those candidates who qualify AIBE Exam will get Certificate of Practice by BCI. The exam will check basic know-how of law and analytical abilities of a candidate and it sets a minimum standard for admission to the practice of law. All India Bar Examination (AIBE) 2018 is scheduled to be held on December 3, 2017. 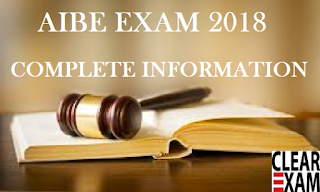 All India Bar Exam (AIBE) 2018 is a standard test for judging candidates analytical skills and the basic understanding of the law. Once the lawyer clears the bar exam only then he/she is awarded the certificate of practice after obtaining which the candidate can practice law in India. The exam will be held offline in 40 cities of India. The exam will be conducted in 11 different languages. The exam is on open book examination and you must take with you the study material that you wish you refer to for answers. One is declared as having cleared the bar exam is he/she answers 40 out of 100 questions correctly. Candidates have to apply through online mode only and the registration process is currently open. One must first register on the website for AIBE 2018. The website for registration is www.allindiabarexamination.com/registration.aspx. One can log into his/her account post successful AIBE registration. AIBE 2018: How to fill the application form? All India Bar Exam (AIBE) 2018 application form is available from September 1, 2017. The first step is to add your personal and educational details and then clicking on the finish button. When you are registering you will have to be ready with documents such as advocate ID card if the same has been issued by the state bar council, the enrollment certificate, a scanned photograph, and scanned signature, and any caste or disability certificate if applicable. All documents should be self-attested. The fee for the application form of All India Bar Exam (AIBE) 2018 is Rs. 3650 for general category and Rs. 2500+60 for SC and ST category. 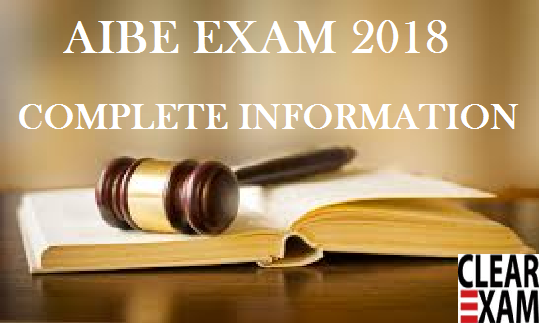 You can take books to your All India Bar Exam (AIBE) 2018 venue since the exam is an open book exam. You do not need to commit anything to memory because three and a half hours is a long enough time to look up the answers from the books. Once the exam of All India Bar Exam (AIBE) is done and students wish to find out the results then the students would have to wait for the results to be declared online on the official website of All India bar exam. You can access the results by entering your roll number and date of birth. The result will only talk about whether or not you have qualified and the students who qualify will be awarded certificate which allows a lawyer to start practicing in any court in India. The results are expected to be out by the second week of March 2018. All India Bar Exam (AIBE) 2018- Complete Information Quick Info: Level of Exam Post - Graduate Category of Exam National Level Exam Exam Frequency.